Choose wisely when deciding where to eat. For us, we have a much better time eating at a casual adult restaurant than a hyped up “kid” or “family” restaurant. It’s not often that we go out in the first place, but I feel that the places that are frequented by more of the hipster family vibe work best. Places that offer small portions, or tapas type faire are great for families. Individual items come out fast and keep things interesting with their element of surprise. Plus, you can get the kids occupied quickly with their own order. Sushi, works well in this way too and kids love edamame and miso soup! A lot of small craft beer restaurants are good for small families and will be more flexible with what they can whip up for kids. I also feel that the quality of the product is higher than with large chains. Societe Brewing has a tasting room and features a lunch truck calendar and you are welcome to bring your kids. The Joint in Ocean Beach andStation Tavern in South Park are also great options. Pick their food first, and make sure the server puts their order in first. I have even scoped out the restaurants menu online first so I can order for Josie right when we sat down. It doesn’t hurt to have your own food picked out ahead of time so you can focus on enjoying yourself. Ask your server about a kids taste plate. The restaurant I work at is a small privately owned neighborhood joint. My manager always has the kitchen whip up a little taste plate for Josie with some house made taro chips, strawberries, sliced apples, some walnuts, Irish cheddar, olives, and sometimes a hard-boiled egg. If it’s not ridiculously busy, I offer this to parents dining with toddlers as well. Always a hit with parents and kids! Shift your expectations into low gear. Dining with kids, like anything else with kids is a “choose your battles” situation. Don’t expect them to be perfect and not touch anything and to sit still and be quiet and to eat. Expect them to be wiggly and be picky and be kids. When we go out and Josie starts mixing the salt and the pepper onto a plate and opening sugar packets, I can see my husband’s frustration starting to rise. He sometimes apologizes in advance to our server, who never seems to mind. As a server myself, I would much rather have the parents relaxed and ordering more food and drinks than stressing over a small pile of spices and sauces. And *spoiler alert* every table is messy after people have eaten at it. So lay off your kid and just enjoy your food and drinks. After you order, buy some time with a quick stroll around the building. Or step outside for a quick minute with your little one to survey the window offerings in the local shops. Pop back inside and go wash your hands. There’s four more minutes of peace and content you just bought yourself. Don’t forget the Crayons! We rarely eat at “family restaurants”, the kind that are stocked with kids menus you can color and mini packs of crayons at the register. So I usually have to pack my own. A great way to mix it up is to have some paper plates stored in your purse too, so you can task the kids with drawing pictures of their food on the plate before it arrives. Tea? Yes Please! Most of the little girls as well as the little boys we know have their own little kitchens and little cups and plates to go with them. 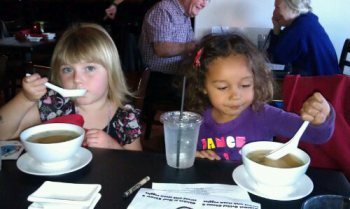 When I have packed Josie’s tea pot and a couple of tea cups and plates, It has kept her and her dining buddy busy for about 10-12 minutes, which is like an hour in mom-talking-to-mom time. Cell phone toddler games. For more reason than one, I am very cautious about kids and screen time. However, on the whole topic of picking your battles and keeping balance in your life, we keep a couple games on our phones. The games prefer are the slow paced, learning games. Puzzles and memory cards make me feel like at least she is working on her brain while she is staring at the screen. Two of my favorite free games for the DROID are “Toddler Memory Lite” and “Fishes for Puzzles”. Bring a few snacks. Some kids are happiest with their favorite snacks. Some kids, like Josie, are interested in new things. I smuggle a few snacks she has never seen before, which seems to keep her interested, plus when we break out the tea set, she sets up the new food on her little blue plates. Timing is everything. The pre-dinner hour is one of the best times in a lot of restaurants for a lot of reasons. It never hurts to call a restaurant and ask how busy they are or tend to be at a certain time. Usually around 5pm is early enough that you have a few choices as far as seating is concerned and can plant yourself in the best corner to contain your little one. Also, the servers are less exhausted and more willing to go out of their way. Plus, the kitchen isn’t backed up with orders and can be more creative and quick with the food. Oh yeah, and the less people in the restaurant, less people you have to worry about your crazy toddler bothering too much.